I walked up to the camp and Botterill said he would come up the Napes with me. Mr. Lloyd and I started up and reached the Dress Circle, where we lunched. In the Needle Gully were three would be climbers and three friends. They tried the crack on the West side but for one quarter of an hour had made no progress. Then Mr. Botterill, Mr and Mrs Addyman and the former’s sister arrived. He led me up the Abbey Ridge which ﬁrst yielded to his powers in April last. Since then, it has been climbed some fourteen times. The climb starts up somewhat broken but firm rock to the left of Easy Chimney on the Eagle’s Nest. Then a large slab projecting over the Arrowhead gully is reached. This affords a good take-off for the next portion which is fairly hard and very sensational. A broad grass ledge is reached which offers a resting place before tackling the next pitch which consists of a magniﬁcent rock face nearly vertical for about 85ft. About 70ft up is an overhanging portion and this is the crux of the climb. The ﬁrst part is very sensational and rather difficult; a short traverse is made to the left and then higher to the right again. The holds beneath the overhang are small and scarce, a most important one being hidden beneath the lower left-hand corner of the projecting rock. Thence, the route is slightly to the right where a little shelf is reached and a pull up on it is effected. A few feet higher another grassy platform terminates the difficult portion. The next pitch is somewhat difficult but quite short. Above that, the easy portion of the Eagle’s Nest climb is joined. We then descended the Needle Arete, Mr Botterill giving me a lesson in leading down. I found the rounded slabs below the West crack the hardest part. The holds are small and few; it is best to keep on the Needle Gully side of the slab, then the holds can be better appreciated. The final pitch is not very difficult to descend. By this time, one of the three men had reached the shoulder and the second was in the crack. Mr Botterill offered to lead them up and we rapidly climbed the Arête. In climbing the last pitch, the ascent to the Mantel-Shelf is best done from the extreme right hand side of the shoulder, then on traversing the shelf to the left, the left knee can be easily placed on the rounded knob of rock. A finger and thumb hold for the right hand being found near the corner, on straightening up on the left knee the rounded hold far right is reached and by standing on the shelf where the left knee is, the top is reached and a pull-up effected. 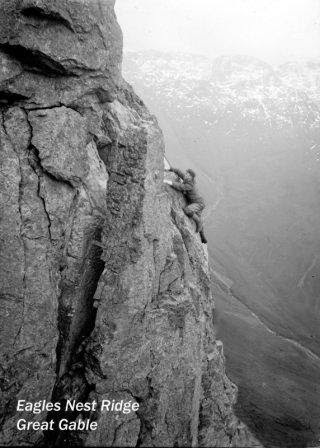 We brought up the three climbers and descended the Western Crack of the Needle — the Wasdale Crack. Mr. Botterill’s climbing is a marvel of neatness and skill, nerve and muscle. He then led the two ladies up the Arrowhead Gully and I led the two gentlemen. Reaching the grassy ridges between Hell Gates, we walked up the left side of the Westmorland Crags to the summit of the Gable. 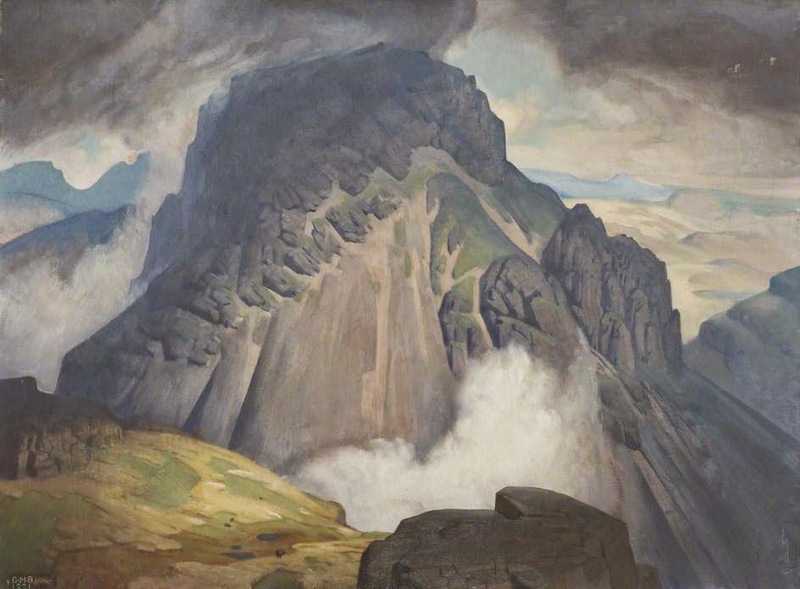 Then down steep grass slopes to the Head Tarn where our party divided — Mr. Botterill, Mr. Lloyd and Mr. Williamson returning to Wasdale and myself and the two others to Seathwaite, thence to the Albion Hotel, Keswick. Cycled to Seathwaite and then walked up Grain’s Ghyll to Great End which was in a thick mist. After refreshments, which included some excellent coffee of Mrs. Abraham’s, we deposited the rucksacks under a large boulder at the foot of the Central Gully and began the ascent. We heard the voices of other climbers somewhere on the crags to the right of our gully but could not see them as it was snowing fairly fast. Abraham led, rapidly kicking steps in the hard snow. Some distance higher, the angle steepened and steps had to be cut as there were two inches of fresh snow lying on ice. There were traces of a previous party but their steps were almost obliterated. About half way up we came to a large pitch in the shape of a vertical wall of ice on the left and a cave roofed in by a large boulder on the right. I anchored myself in the cave while Abraham cut up the wall on the left. About two thirds of the way up or 15Oft higher, the gully was divided by a narrow rib of rock. The left hand branch ran up to the sky line some 80ft higher in a very steep slope. Abraham was beneath the central rib of rock and I was some 6 yards behind and sheltered by the projecting rocks on the right of the gully. At this point the mist thinned and the sun came out faintly overhead. We were admiring the scenery which was magnificent when our attention was attracted by a hissing noise in the left hand gully.A few second later a large quantity of the surface snow shot past us and disappeared with a faint roar over the vertical wall below. 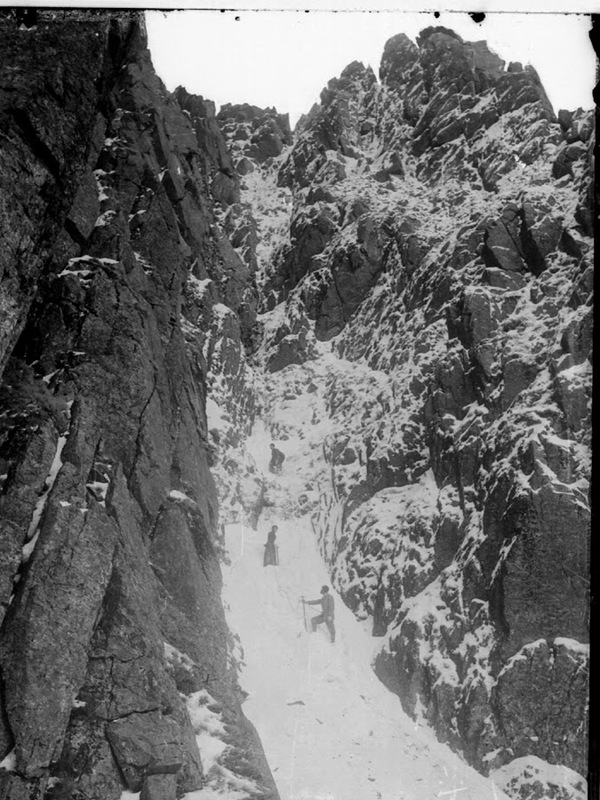 Before we had quite recovered from our astonishment, a similar but larger avalanche swished down the right hand branch, up which our route lay, and passing between us, (we held up the rope to prevent a jerk) obliterated all traces of the steps which Abraham had cut. Never having been on a snow slope before, I was somewhat alarmed although our positions were quite safe. The friendly rocks effectively protected us from avalanches but their ascent was impracticable. After a consultation during which two more avalanches passed between us -so close that either of us could have touched them from where we stood -and disappeared over the pitch below, leaving a track of smooth ice which looked very sinister, we decided to descend the right side of the slope, under the shelter of rocks for 50ft and then to force a way up a break in the right wall. To effect this, it was necessary for Abraham to traverse the exposed portion of the slope, to where I was anchored. To shorten the time during which he would be on the dangerous part, I cut three steps on my side of the slope and he did the same on his. Then after the next avalanche he rapidly and very skilfully traversed the slope and joined me. We descended to the break in the wall and Abraham led up on to the face. The rocks were coated with ice and snow and in parts very rotten but they seemed very welcome after the treacherous snow in the gully. The rocks necessitated very great care and took us about 3 hours, but John Abraham led splendidly. It was very cold and snowing again when we reached the summit cairn. We consulted my compass -unfortunately the map was left in the rucksack and so was the lantern — and we struck off in an Easterly direction. We passed two other cairns leading down towards a steep snow slope and cautiously following it we came upon some footprints and farther on traces of a path, which led us down on to a sort of col. The valley to the left was our objective but the direct descent into it appeared steep and craggy in the dim light, so we followed the path thinking it would shortly bend round to the left. However, some long time passed before we came below the mist and there in front of us lay a fine tarn, with our path winding up the fell side above it and to the right. Abraham said it must be Angle Tarn, and that we were on the Esk Hause track to Langdale. It was very dark by this time, and we did not wish to get to Langdale or to return to the summit of Great End, so we struck off down the valley on our left by the side of a stream. It was stony, rough and very dark. In parts it was boggy and very soft. For hours we trudged gaily along without any signs of human habitation. Once we came to a fine wall with a gate leading through and we expected to come on a house, but in vain. We struggled along through streams and over boulders, yet remarkably happy and contented withal. Eventually, J .C.A. spotted a continuous wall on our left and thought there might be a path on the other side. We scaled it and were delighted to find traces of one. It varied absurdly from a perfectly level carriage road to a rough scramble over boulders. Gates we encountered at intervals, but still no sign of habitation. Eventually, on rounding a corner, we saw a distant light and raised a cheer. In a few minutes we reached the cottage and on enquiring where we were, heard that it was Stonethwaite and we had walked the length of the Langstrath Valley. A farmer very kindly took us a short cut over the fields to the main Borrowdale road, and an hour later we reached Seathwaite Farm again. It was 10.00 p.m., we had been out 12 hours, had three sandwiches to eat and done a strenuous climb. When asked what we would like to eat, Abraham suggested ham and eggs and these were promptly prepared and ravenously eaten. The coolness of these proceedings did not strike us until later. We retired to bed but were too tired to sleep soundly. However, we awoke refreshed and discussed the situation. Whiting expected us Sunday evening and we feared that he would wire to Keswick, and on finding that we had left, would send out a search party. Hence we thought it our duty to reach Wasdale as soon as possible. Accordingly I left at once and reached the hotel at 9.00 a.m., in time for breakfast. Then I returned to Sty Head to meet J .C.A. and Westmorland who had brought down our rucksacks from Great End. Expecting to do Kern Knotts, I had left my axe behind. As Westmorland was keen on doing Cust’ s Gully, I went back to Wasdale and the other two went on. They had a good day and found that most of the new snow had come down.